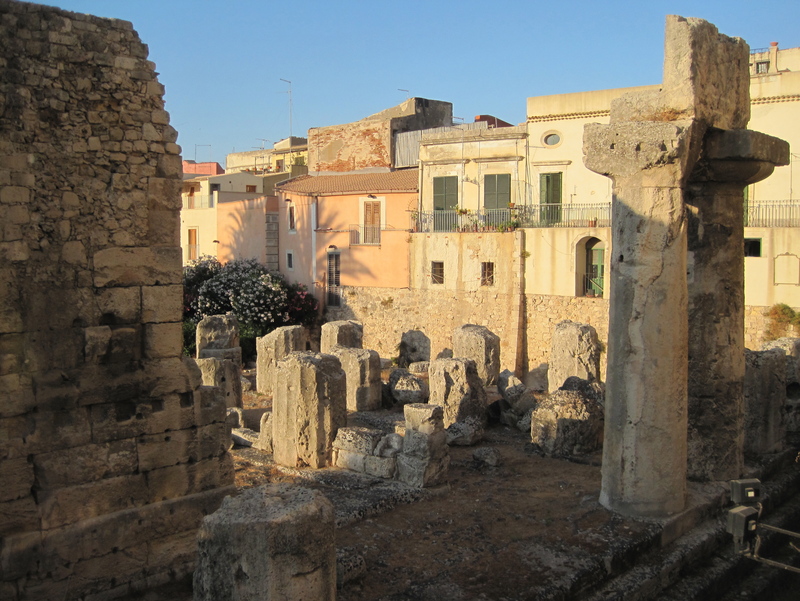 As the patron saint of Sicily’s ancient city of Syracuse, Santa Lucia’s image is scattered around the city. We didn’t think much of it until we spotted the strangest delicacy in a window of the local pasticceria, pastry shop: eyeball cookies. That’s right! Displayed on a tray right in the front window were oval shaped cookies, each with a dollop of fruit in the center. 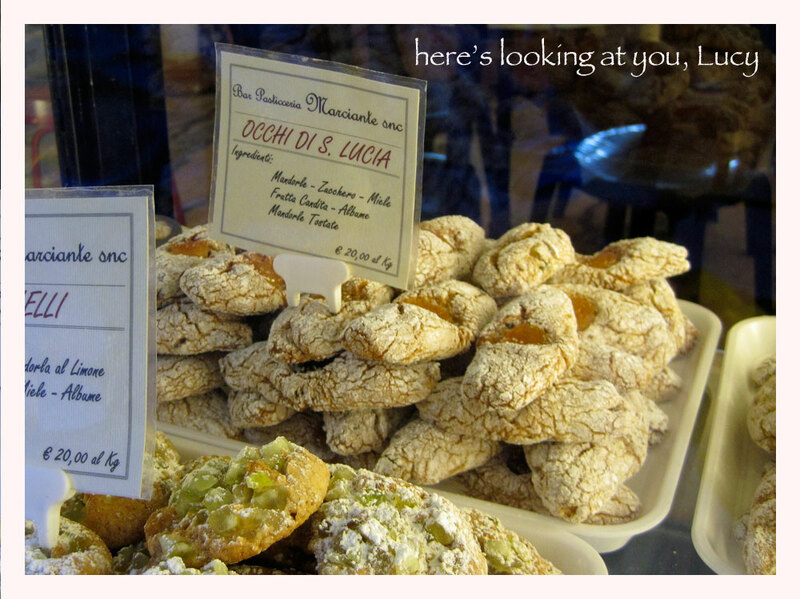 The sign boasted: Occhi di Santa Lucia, Eyes of Saint Lucy. Our curiosity kicked-in and we wanted to know more about that “Lady of the Light” (Lucia means light), and what that eyeball thing was really all about. The legend goes something like this: She was born around 284 in Syracuse under Roman rule, which was originally founded in the 6th century BC on the Sicilian island of Ortigia—one of the wealthiest cities of the ancient Greek empire. As a young girl, she was visited by a vision of an angel as she prayed for her ill mother. That experience caused her to devote her life to Christ. Always independent, Lucia knew from that young age that she had a specific destiny to fulfill—which eventually created a few problems for her. Unfortunately, around that same time, the Roman emperor, Diocletian, was losing control of his empire, and was getting really aggravated with the Christians. He was sick and tired of everybody talking about how wonderful Lucy was. He’d heard that she worked in the catacombs, wearing a “halo” of candles to light her way. Diocletian was probably just jealous. As a result, he had his mind set on destroying Lucia because she was just way too popular. But she resisted all of his schemes to tarnish her reputation. Of course, she had God on her side, and wasn’t afraid to call for a miracle or two to thwart the despicable plans of the emperor. Rumor has it that when the Roman troops came to drag her off to a brothel to start work the next day as a prostitute, (her punishment for being so nice) she became “immovable.” That’s right, immovable. 1000 men couldn’t budge her, and finally brought in a team of 50 oxen to do the job. Even that didn’t work. Obviously, she was a real force to reckon with. Now, back to the eyeball thing. According to a chapel dedicated to her in the main church of Ortigia, Lucia had beautiful eyes. In fact, they were so beautiful that men noticed them and pursued her. She was single-minded in her dedication, so plucked out her own eyes, so that she was free from distraction. Pretty dramatic, don’t you think??? The creepy part of the story is that she carried them around in a shallow dish. Another version of the story is that Diocletian, in a fit of rage, had them gouged out. Either way, she’s been depicted for the past 17 hundred years in paintings and statues, carrying her eyes in a dish. The more we found out about Lucy, the more we liked her. She was such a powerful and threatening figure, that Diocletion eventually did have her killed on December 13th, 304, and the rest is history. Martyred for her convictions, she is celebrated each December with processionals. 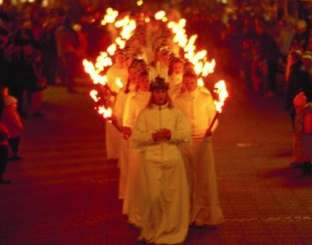 The parade is often led by a young girl wearing a crown of candles. She is followed by other girls, each holding a single candle. The candles symbolize the contrast between light and dark, as winter days become shorter. 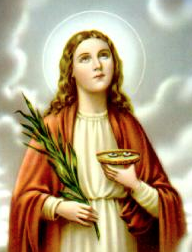 Santa Lucia is actually one of those few saintly saints who have changed the world far beyond her home town. What a strange but beautiful story. Of course, it has become legend, which means embellishment with every retelling, but that’s what good stories are made of. As for us, we loved it—well . . . except for the eyeball cookies. P.S. There is a happy ending to this gruesome tale. All reports say that Santa Lucia‘s beautiful sparkling eyes were completely restored upon her death. 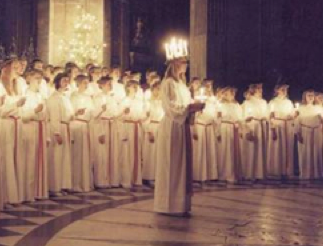 *Halo of candles, Lucia with eyes in a dish, and Lucia processional images are courtesy of the internet. Thanks. Yes, this is a beautiful story. Cheers for Saint Lucy! I think I would have tried one of the eyeball cookies. Good post.